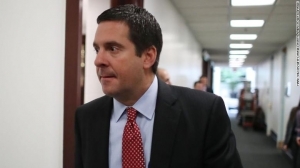 FRESNO (KMJ) — Despite losing the majority in the House of Representatives, Congressman Devin Nunes said the results from Tuesday’s midterm elections were actually a win for the Republican party. The power shift towards the Democratic Party means Nunes is expected to lose his position as Chair of the House Intelligence Committee. “I don’t view last night as a loss,” said Nunes Wednesday morning. “I think it was a huge huge victory for the conservative movement, for the Republican party. Nunes said picking up seats in the U.S. Senate is a part of the Republican victory. Members of Congress representing the Central Valley largely remained the same following the midterm results: Sen. Dianne Feinstein, Rep. David Valadao, Rep. David Valdao, and Rep. Jim Costa all retained their seats on Capitol Hill. Rep. Jeff Denham lost his seat to challenger Josh Harder. Congressman Nunes also commented on the resignation of Attorney General Jeff Sessions.